Looking for a Unique Wedding Option? Schedule a Consultation! Cake balls and cake pops are a great way to mix traditional with trendy at your wedding. 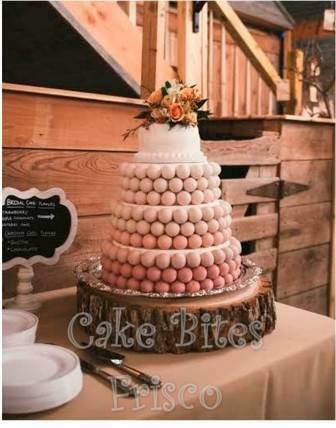 Here at Cake Bites we offer a variety of wedding options including cake ball cakes, tiered displays of cake balls, cake pop displays, cake ball stadiums and groom's cakes, and cake ball and cake pop favors for your guests. If you're looking to make a delicious, long-lasting impression on your wedding day, contact us to schedule a consultation and tasting. We are quickly booking up for spring and summer weddings so don't delay - schedule your consultation today by emailing us (info@cakebites.biz) or calling (214)449-8747.